Retargeting ads are a great medium to use to hack the forgetting curve. This is why they are so prevalent for companies in nearly every industry or niche. The best way to use retargeting ads in this capacity is to segment your users based on intent. The users with high intent should be seeing your ads more frequently. Determining intent can be done in a few ways. A common best practice is to assign values to certain pages and target users that view them. Ideally, these pages are close to conversions. Once you have a potential customer’s email address you have the opportunity to build a relationship with them and nudge them back into considering your product. By setting up a short automated email sequence you can reduce the chance of these customers forgetting about your product by up to 80%. There are a bunch of providers for email campaigns like this. MailChimp, Vero and Campaign Monitor are a few that have features that enable a lot of customization. Content is an opportunity for companies of all shapes and sizes. If your company routinely puts out engaging, industry-specific content you can reach potential customers without directly selling. Buffer does an outstanding job with content marketing and is one of the main channels that has been fueling their outstanding growth. By maintaining this thought-leader relationship with potential customers you will have multiple touch points and stay high on the likelihood of memorization curve. 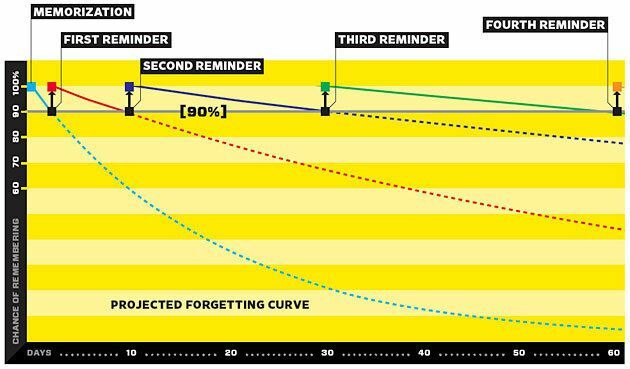 These three tactics can help your company stay on the winning side of the forgetting curve. Putting in the extra work to have more touch points with potential customers can be the difference between growth and sending out a ‘we’re shutting down’ email.